Yamaha GYTR® Clutch Components are precision machined from aerospace-quality aluminum alloys with a unique hard coating. 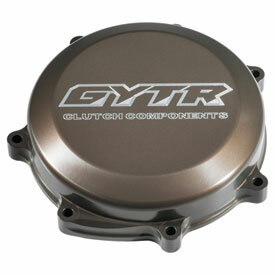 This provides superior performance and clutch feel, as well as excellent component durability. The patent-pending "auto oiling system" forces oil through specially cut holes in the pressure plate, into the inner hub, and then to the clutch plates. This results improved clutch performance, with lower clutch temperatures, less clutch expansion and extended clutch life. dont have it for the 125? In the description is states that the cover is black but on the picture it is a brownish copper color? BEST ANSWER: It will look just like the one in the picture.